When you think of the USA, Indiana probably isn’t the first place that comes to mind. Still, it’s the place I’ve grown up and lived for over 20 years, and I know it has a ton to offer. It’s probably no surprise then that I’m writing this Indiana travel guide! For starters, there’s an abundance of outdoor adventure to be had in all corners of the state. If you’re a history buff, a beer lover, or someone who’s travelling with children, you’re in luck too! We’ve got so much to choose from to entertain anyone in the group. A yellow daisy close-up during an Indiana summer. Views looking up at the bottom of the forest in Indiana. Teeny yellow flowers are in bloom in Indiana during the summer. Cost is often a concern for budget and luxury travelers alike. Fortunately, Indiana is ranked among the top most affordable states in the US, which is a rather expensive country. Another perk of Indiana is its location: in the mid-west US. (Which yes, looks more like the middle-east side of the USA on a map – but just trust me on this.) From Indy, you can easy get to major cities in all directions within a few hours. Chicago, Detroit, Nashville, Cincinnati, Louisville, Milwaukee, and St. Louis are within a 5 hour drive from Indianapolis. Indianapolis is our capital, which is smack in the middle of Indiana, and is a.k.a. Indy or Naptown. We’re a landlocked state, with no oceans in sight, but beaches, mountains, forest, and plains (and plenty of farm land) are still within a days drive. Lake Michigan sits along our northern border and is big enough you could almost pretend its the ocean. A walking path at Griffy Lake. If I haven’t sold you on it yet, we have a reputation in the US for being a friendly state. Most people will greet you with a smile and would be happy to help if you’re lost and need directions. If we bump in to you, we might utter the phrase “Ope” before apologizing. It’s just the way we are, and I think it makes for a welcoming environment. I could go on and on (and I will soon in another post about why I think Indiana is underrated). But since I’m sure you’re dying to visit now, I’ll dive right into my Indiana travel guide and show you the best-of-the-best in the state. Read on for recommendations from over 15 locals on day trip ideas, dining suggestion, and can’t-miss attractions. My favorite hidden clearing at Griffy Lake. Indiana has over 34 parks and lakes to explore. I’ll share my personal top 10 parks and lakes in Indy here, but you should check out the state website for more info. Note that my recommendations are in no particular order. The map below includes all attractions included in this post – not just the outdoor adventures, as the icons indicates. Horseback riders and hikers will love Brown County State Park. The park boasts over 70 miles of bridle trails and 18 miles of hiking trails available to guests. If you’re traveling with your beloved pony, you can bring it to the park to ride. For the rest of us, there’s a Saddle Barn to have a guided ride instead. Camping is an option too at one of Brown County’s many popular campsites. The Turkey Run State Park site describes the park as full of “natural geologic wonders” the likes of sandstone ravines and aged forests. Throw in a few swimming pools and tennis courts, campsites and conference centers, and a historic cabin celebrating the father of Indiana State Parks. Now you’ve got a park that will please the whole group! Pokagon State Park gets its name from the last notable Potawatomi leaders of the Native American tribe who lived in the park lands. Though its many lakes make it a great sight to visit in the summer, Pokagon is best known for its winter festivities. The park is home to a quarter-mile long toboggan reaching speeds over 30 mph. You can also rent cross country skis, sled, or go ice-fishing if that’s not enough chill and thrill for you. Photo from Visit Indiana website, featuring the famous toboggan run in the winter. Another great place for hiking, Fort Harrison, also offers horseback riding, golfing, fishing, and sledding when there’s snowfall! It’s located on the northeast side of Indianapolis, sitting on over 1700 acres. There’s plenty to explore, and its proximity to the capital makes it great for those stopping through the city. There’s also a Museum of 20th Century Warfare nearby that shares the story of soldiers who marched in Fort Harrison, for the war-history buffs among us. I know they say not to go chasing waterfalls, but if you’re feeling rebellious, just head to Southeastern Indiana and pay a visit to Clifty Falls. Though great for hiking in all seasons, winter and spring are the best times to see the falls. Bring a magnifying glass to look out for fossils that are scattered on the park floor, remnants of marine life that used to occupy the land. Located along Lake Michigan in northernmost Indiana is the Indiana Dunes, your place to hit the beach in the landlocked Midwest. There’s over 3 miles of beach, not to mention the large dunes which tower 200 feet above the lake. I have fond memories of running up the dunes as a small child, wearing myself out between the sand and swimming. Photo from Indiana Business site, featuring the sandy dunes and Lake Michigan in the summer. There are four hiking trails at Lake Monroe, all easy to moderate skill level. It’s a perfect park for beginner hikers or young children. There’s also a few small beach areas by the lake for those who want to forgo the hiking altogether in favor of laying out by the water. Lake Monroe is a popular spot for IU students needing a break from campus life. Explore the Bluespring Caverns Park by boat from April through October with a guided tour. You can also see Indiana’s largest sinkhole and try your hand at mining gemstones at the Visitors Center. Reservations are strongly recommended at the caverns for groups of 12 or more. Located in Southwest Indiana, the Caverns provide an exciting stop in a lesser-visited region of Indiana. Griffy Lake is a short, 10-minute drive off the Indiana University (IU) Bloomington Campus. Since I was a student at IU, I visited Griffy Lake often when I needed a retreat into nature. You can take one of several walking paths through the forest enjoying the quiet hum of the wildlife. Look for secret little openings along the path that lead to clearings perfect for reading or a quiet picnic. You can also rent a canoe in the summer months for around $7. Griffy is great if you’re staying on campus and don’t want to travel far to get a little more nature. Tucked away in the Charles C Wilderness Area, this fire tower is one of my favorite off-the-beaten-path spots in Indiana. About a 20 minute-drive into the park, (mostly because of the dirt/gravel road that requires a slow pace) you’ll find the fire tower and a small parking lot. Some 133 steps later and you’ll reach the top of the tower, afforded with great views of the surrounding forest. At night, you can see the lights from surrounding cities like Indianapolis and Lexington, Kentucky. Come at the right time and you might even catch some shooting stars! 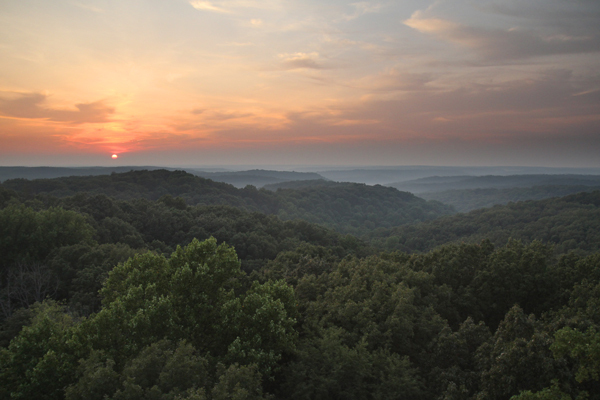 Photo courtesy of Cloudinary website, featuring the views of the Indiana State Forest at the Hickory Ridge Fire Tower at sunrise. Indiana has a rich history and plenty of places to explore it throughout the state. Learn about the Native Americans who lived in Indiana before English settlers arrived. Puzzle over modern art galleries. Explore what life was like as a slave on the Underground Railroad in Indiana. Marvel at the classic elegance of historic French Lick. Satisfy your curiosity in colorful exhibits about mummies, waterways, and dinosaurs. Or spend a week in Indy and see it all! Don’t let the name fool you – the Indianapolis Children’s Museum is a blast for all ages. You can ride a carousel, climb around on a giant play-place, dig for dinosaur fossils and touch a real T-rex bone, walk on a virtual-reality tight rope, learn about children who changed the world, or practice your story telling skills. To name just a few! I put it in this museums and history category because I don’t want any adults or child-less travelers to miss out. Photo from the Childrens Museum website, featuring their Dinosphere exhibit. Modern Art isn’t everybody’s thing but if it’s yours, the Indiana MoA has what you’re looking for in their many exhibits. If you aren’t much into art but prefer greenhouses and gardens, or even beer, they have that too. Ranked among the worlds best contemporary Native art collections, the Eitlejorg is home to engaging exhibits on Native American culture and Western US culture – no surprises there. You might be surprised how fun this museum can actually be, though! From exhibitions on GLBT representation in Western film, to pistols and motorcycles, to the Indian Market and Festival, you’ll learn tons without setting foot in a classroom. Connor Prarie is a unique and hands-on museum about Indiana during the 18 and 1900s. In the 1836 Prarietown butter is churned by hand and meals are cooked over hearthstone fires. Jump ahead to 1859 in the giant hot air balloon to learn about manned flight and how it became a reality. Visit the historic William Connor house, or enlist during the Civil War to fight against the confederates. Wander the Lanape Indian Camp and practice tomahawk throwing and fur trading at the outpost. This is a perfect place to learn about what life was like for Indiana citizens over the past few centuries in a hands-on way. Photo courtesy of the Connor Prairie website, showing a child throwing an axe at one of their exhibits, in front of a giant hot air balloon. Photo courtesy of the Connor Prairie website showing a mother and her daughter dressing up at a discover exhibit. This outdoor park is another that celebrates the Native American culture in Indiana. Specifically, you can visit 10 ceremonial burial mounds built by the prehistoric Adena culture indigienous peoples. These burial mounds were later used by Hopewell culture inhabitants several centuries later. The first and largest of these mounds was believed to have been built in 160 BC, so it dates quite extensively into Indiana’s past. You can also canoe on the White River inside Mounds State Park. The whole French Lick area is a site to see. Outside of this particular museum, there are scenic railways and the famous French Lick and West Baden hotels that can’t be missed. French Lick may even be most famous for its casino that draws a lot of tourism. That said, this is the best museum to learn about the area’s history in the early 1900s. From the popular circus show to the rich and famous who loved to visit the French Lick region, this museum is a great insight into older Indiana culture. Indiana’s food scene can be very diverse depending on where you visit. Indianapolis is one of our better cities for food, unsurprising as the capital. Bloomington is pretty incredible too, and my recommended place to go if you’re looking for international eats. Because I’m a foodie, I could share a hundred restaurants I love and why I love them. For the sake of brevity in this post, I’ll just list my favorites in each category, with a special focus on local Indiana eats. Get your snacks ready! Rated one of the top restaurants in Indiana. Fresh seafood shipped in daily at affordable prices. Try the Tuna Salad – it’s smoked, high-quality cuts of tuna in an incredible tuna salad recipe that isn’t like any tuna salad you’ve had before! While there are 40-50 stands selling produce, meats, and cheeses, the Market hosts nearly 20 food stands where local vendors sell their croissants, crepes, bagels, smoothies, and other delectable goodies. Head straight to the back of the market for breakfast before perusing all the market stands. People shop around the various stalls at the Bloomington Farmers Market, photo courtesy of the Travel Indiana site. If you want to see the extreme side of Indiana eating. Or if you just really love bacon. They make their own root beer! For famous, spicy shrimp cocktails, drinks, and a nice steak. Locally owned, family operated, wood fired pizza – What else do you need? The various sizes of burger patties, pre-cook, served at Bubs Burgers and Ice Cream. Photo courtesy of the TripAdvisor. Overlooking the Ohio River, this “family owned and family oriented” restaurant provides great views, great food, and a great time. Bring in your loved one on their birthday and subject them to Key West’s famous lobster hat. A quick note about tipping culture in Indiana – we DEFINITELY tip. On average service, 15% is usually the norm, with great service getting 20-25%. For carry-out or food trucks with quick service, $1-2 is fine. It’s considered extremely rude to eat at a dine-in restaurant and leave without tipping. Servers generally make their wages off of tipping, so factor this into your dining budget! As for restaurant culture – most restaurants will have a host that will lead you to your seat. Unless there is a sign that says “seat yourself” or you sit at the bar, nobody will know you’re there if you seat yourself. Most people leave within 15-20 minutes of finishing their meals. Lingering at a table without ordering more food takes up valuable table space for servers trying to make tips from other diners. Generally speaking, your waiter will bring your bill to the table shortly after delivering your food or confirming that you don’t want anything else. Across this great Midwestern state, there are countless of activities for kids and things to do with families in Indiana. Most of these will push each member in your group to learn and explore their creative sides, no matter their age. All of them will give you a day to remember with your loved ones. A smaller sort of children’s museum, this Bloomington museum is a thrill for kiddos and science lovers. Though there’s lots of special learning events for young learners (and their older guardians too), you’ll hardly be bored with over 65 permanent, hands-on, science exhibits the Wonderlab offers. Create a symphony at the Giant Xylo Pipe station. Let your youngest explorers learn at their own pace in the Discovery Garden. Get soapy and silly in the Bubble-Airium exhibit. Meet bearded dragons, blue tongue skinks, and chuckwallas in the Natural Science animal wing. The Indianapolis Zoo has beautiful animal exhibits from around the world. While our polar bear recently moved to a location in another zoo (better suited to its older age), the orangutan living space is a very new addition. Kids can see how they size up against cheetahs in a foot race, ride a mini-coaster, get their face painted with a colorful animal of their choosing, or feed a giraffe. A lioness and her cub pause on a rock to drink some water at the Indianapolis Zoo. Photo courtesy of the Indy Zoo website. Looking for a thrill in the form of a zipping, wooden roller coaster? If heights are not your favorite, you can enjoy the water rides and lounging in the Splashin Safari part of the park. Holiday World perks, aisde from obvious fun, include unlimited free, sun screen, wifi, and parking! The park also boasts the world’s longest water slide and only launched wing coaster. The zoo provides variety, but the Wilstem Ranch provides up-close and personal encounters with some of your favorite animals – elephants! They recently added kangaroos and giraffes, and they have had horses, chickens, and goats on the property for some time now. While you get a chance to help with bathing the elephant, it’s well regulated and considerate of the ellies’ needs and personal space. During winter months, these heat-loving creatures move down to Florida to escape the Indiana cold, so make sure to visit during the warmer months. Best visited in the autumn months for its pumpkin patch and apple picking, Tuttles Orchards are open year-round. This spot is a family favorite for Hoosiers (local Indiana-folk) who have been visiting this orchard for over 90 years. Have a meal at their café, purchase some goodies at the farm store, or try one of their famous apple cider slushies. Check their schedule for special events throughout the year, too. The corn maze at Tuttles Orchard. Photo courtesy of the Tuttles Orchard website. A child pulls a wagon across the apple orchards at Tuttles. Photo courtesy of Tuttles Apple orchards site. Indiana is an agricultural state. Whether you’re arriving by car, plane, or train, you’ll probably notice the fields and fields of corn, soy, wheat. Bring the family to learn about farm life in an exciting new way. Fair Oaks Farms offers a restaurant and three experience: the Dairy Adventure, the Pig Adventure, and the WinCrop adventure. In these experiences, you can witness a cow or piglet being born, meet real farmers who grow our food, or explore what modern farming means, all on one farm! As I did with restaurants, I’ll highlight the top accommodations across a few categories and save the thorough reviews for another day. I’m fairly certain I’ve given you enough suggestions to keep you busy for a few weeks. To round up this Indiana travel guide, I want to share some helpful details in a few final categories: and safety/accessibility and transportation. The US is getting a lot of bad press for the many mass shootings we’ve experienced in past years due to gun violence. Despite this, we Hoosiers are a gun-toting people. (I am not personally a gun owner, but we have a very high ratio of guns to people in this state). You’ll also notice a surprising amount of billboards advertising places where you can buy your very own gun. This is something I had no idea was uncommon until I started exploring further beyond Indiana and the Midwest. Though our governor has promoted oppressive and hateful ideals and legislature against LGBTQ communities, it’s otherwise a pretty safe and accepting state. Bloomington is a particularly LGBTQ-friendly city, with lots of great gay bars, and a huge Pride Festival and Pride Film Festival each year. Indianapolis also has a lot of LGBTQ friendly events and clubs (probably more than Bloomington due to its much larger size). Most Hoosiers will identify as Christian, with a decent number of Catholics too. There are innumerable churches scattered throughout the state, and politically, we’re pretty conservative. For the most part, though, you can travel through Indiana without encountering or engaging much in the religion & politics if you so choose. But you’ll more than likely see a lot of billboards For all the conservatism, there are also a lot of liberal hot-spots like Bloomington. Your wifi should work, unless you’re driving through the most remote corn fields or towns. There are plenty of coffee shops around too with free wifi. By and large, Indiana is a very safe place for solo travel, for any gender. I travel across the state by my own regularly and haven’t had any issues. However, like many major cities, crime can be an issue. I wouldn’t recommend walking around downtown in major cities at night, alone. 911 is the number to call for any emergencies. You’ll find most Hoosiers ready and willing to help when possible. Indiana does have greyhound buses and bus stations throughout major cities. However, I would recommend renting a car for long distances across the state or if you’re staying outside of the city and attractions you want to visit. Within cities, Uber and Lyft are popular and pretty affordable on most days/times. At the time of my writing this (March of 2018), a tank of gas is costing around $2.50/gallon. Indiana sometimes struggles with our infrastructure, and particularly in the cities and suburban areas, potholes can be horrendous in the transition months from winter to spring. Poor drainage means the generous precipitation often seeps into the roads, freezing. Later, this water expands when the temperatures warm, causing breaks and disintegration in the cement roads. This year, they were so wild that some were several feet deep, and entire roads were barely drivable. It’s especially recommended to purchase insurance if you’re renting during this time. For the most part, your GPS will get you there with no problems. Careful in the country backroads though – sometimes cell service is lost. If you end your trip to re-route, you may have trouble getting the directions going again. Prepare to drive through a lot of corn if you’re off the main interstates. Views of an Indiana Soybean field in the fall time. Indiana is certainly not the top tourist spot in the US. It might not even make the top ten most popular states. But although the masses aren’t yet behind it, I’m a firm believer that Indy is a great place to visit no matter where your interests lie. I hope this Indiana travel guide has given you a taste of the adventure that awaits you in my home-state. THANKS FOR READING MY INDIANA TRAVEL GUIDE!